Arizona has one definite advantage over many places – the ability to grill outdoors for most of the year. Now that the summer heat is finally starting to die away, it’s becoming prime grilling season too. The typical Americana fare that makes it way over a bed of coals does not usually conjure up images of fine wine however. While ice cold beer is often a great accompaniment to a juicy piece of meat cooked over fire, don’t underestimate the potential for a nice glass of vino to go with your grilled meat and seafood. This month, I’ll delve into wines that are a nice pairing with even simple grilled foods. After all, a hotdog deserves a tasty beverage too. While most people don’t consider burgers and dogs haute cuisine, they still have the requisite savory flavors that pair well with wine. The challenge typically comes in matching the simplicity of flavors in a burger with wines that are viewed as complex. A big bold Cab for instance may not go with a simple ketchup and mustard topped burger. There are grapes though which deliver distinct, juicy and spicy flavors that are good partners. Start with Zinfandel. Why not partner the quintessential American grape with Americana fare? Red Zin typically offers big, ripe, strawberry fruit flavors with brambly back palate spice. I most commonly recommend red Zins with Mexican carne asada, burgers, dogs, and other simple grilled cuisine. The ripe and spicy flavors of Zin hold up well to the sweet and spicy flavors of condiments, and the big fruit matches the savory flavors of meat. Even a decent White Zin pairs with simple grilled fare. Find one that isn’t overly sweet. Carol Shelton wines out of Sonoma is a personal favorite in the Zin department. A few other easy to find winery labels known for Zins are Ravenswood, Seghesio, Klinker Brick, and Tobin James. The next red to roll out when you fire up the coals is Petite Sirah. It’s a bit of a dark horse grape that not many are familiar with, but it’s one that grows well in the warm climate vineyards of the western U.S. and produces a nice, hearty, fruit forward wine with good complexity, which again holds up well to straightforward grilled foods. While I’d go Zin over Petite Sirah for items such as burgers and dogs, Petite is great for when you step up to items such as chicken or ribs. It has a bit more body and tannin than most Zins, with darker fruit flavors and more pronounced spice notes that match very well with the richness of foods like ribs. Petite Sirah is not quite as common to find, as it’s a lesser grape versus the common offerings, but if you look to your better liquor stores they should have a decent selection. Spellbound is a good quality, inexpensive label to get your feet wet. Common producers are Concannon and Bogle. If you’d like to treat yourself to something a little more premium, give Stag’s Leap Winery a try. One can’t forget about the whites either. Grilled fish, shrimp, and other seafood is always a treat. The key in pairing white wines with items off the grill is to match the smoky/charred flavors that come from grilling with a lighter bodied meal. Lightly oaked Chardonnays usually work quite well, as do California style Sauvignon Blancs. If you want to go light and refreshing with a wine that partners with just about anything, break out the bubbles with a little sparkling wine. Blanc de Blancs and Blanc de Noirs options pair well with lighter and richer grilled seafoods respectively. A few white recommendations are Gruet Blanc de Noirs, Schramsberg Blanc de Blancs, and Ferrari-Carano Fumé Blanc. If you care to step up a little and try something different, give the Treana Marsanne/Viognier white blend a shot. It’s a personal favorite. There is no need to fear the grill when it comes to your wine selections. Every cuisine will match in some shape or form to a wine option. If you want a beer, by all means enjoy one. If you prefer wine though, it just takes a little thought as to which options go best with the food choice. 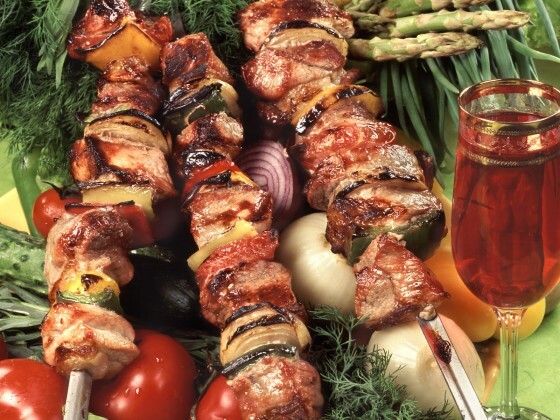 Simple foods pair well with fruit forward wines, so reach for the Zins, Petite Sirahs, and other grape varieties grown where grilled meats are king. Yes, even the lowly hotdog can find harmony with a nice glass of wine.